Grape Growers have been focused on water conservation for years. Specifically for the past 2 years, they have collaborated with local, regional and state agencies and other agriculture groups to educate growers on conservation best management practices and new technologies. They have specifically adjusted farming practices (cover crop, pruning, cluster dropping) in order to conserve water. They’ve also invested in new innovations to better monitor water needs on a vine-by-vine, minute-by-minute basis, including pressure bomb testing, Evapotranspiration sensors, etc. Fortunately, grapes are very efficient crops and do not need much water. In fact, grape irrigation uses only 3-6 inches per year in Sonoma County so that remaining water accumulated in the rainy season goes back into the ground and recharges the aquifer. Sonoma County Winegrowers are committed to becoming the nation’s first 100% certified sustainable wine region by 2019. This program adheres to many water conservation best practices, including water reduction, water quality, soil moisture monitoring, deficit irrigation, and more. Many growers near Green Valley, Mill, Dutch Bill and Mark West creeks have recently volunteered to participate in a 25% water reduction program in partnership with State Water Resource Control Board and California Department of Fish and Game. Currently, 68 parcels representing approximately 2,000 acres of land have enrolled in this voluntary water reduction plan. 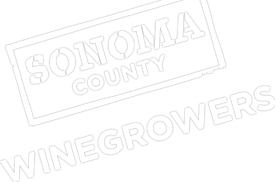 Many vineyards across Sonoma County are using recycled water or tertiary-treated water from the City of Santa Rosa to irrigate their vineyards. Grape Growers utilize a variety of tools and innovations to help them monitor their vines and ensure they use water and irrigate only when necessary for vine health. This includes deploying weather stations, using soil moisture probes to analyze soil moisture levels and depletion throughout the root zone, and the use of drip irrigation to ensure every drop counts. Grape growers have made a significant investment in wind machines to protect their vines from the threats of frost. This practice drastically conserves water and reduces the reliance on diversions of water from streams.